2016. Dispossession and the Environment: Rhetoric and Inequality in Papua New Guinea. New York, NY: Columbia University Press. 2012. 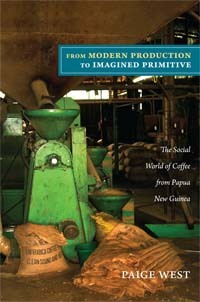 From Modern Production to Imagined Primitive: The Social Life of Coffee from Papua New Guinea. Duke University Press. 2006. 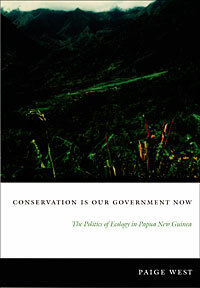 Conservation is our Government Now: The Politics of Ecology in Papua New Guinea. Durham: Duke University Press. 2015. Tropical Forests in Oceania: Anthropological Perspectives. (eds. Bell, West and Filer). 2009. Carrier, James G. and Paige West, eds. Virtualism, Governance and Practice. London: Berghahn Books. 2008. Walters, Bradley, Bonnie J. McCay, Paige West, and Susan Lees, eds. Against the Grain: The Vayda Tradition in Human Ecology and Ecological Anthropology. AltaMira. 2010. Surroundings, Selves and Others: the Political Economy of Identity and the Environment. James G. Carrier and Paige West, eds. Landscape Research, 34 (2). 2006. West, Paige and Martha Macintyre, eds. Melanesian Mining Modernities. The Contemporary Pacific 18 (2). West, Paige. 2017. Translations, palimpsests, and politics: Environmental anthropology now. Ethos: Journal of Anthropology. Vol 82, Issue 5. Sterling, E.J., et. al. 2017. (one of 15 co-authors) Biocultural approaches to well-being and sustainability indicators across scales, Nature: Ecology and Evolution. doi:10.1038/s41559-017-0349-6. Pub. 23 Oct.
West, Paige. 2017. “Disposession.”, Theorizing the Contemporary, June 28. Cultural Anthropology (https://culanth.org/fieldsights/1150-dispossession). West, Paige. 2016. An Anthropology for The Assemblage of the Now, Anthropological Fourm 26:4. (December issue). Valencia, V., Naeem, S., García-Barrios, L., West, P., Sterling, E.J., 2016. Conservation of tree species of late succession and conservation concern in coffee agroforestry systems. Agriculture, Ecosystems, and Environment. Volume 219, March 1, pp 32-41. West, Paige. 2015. Anthropological Indeterminancy. HAU: The Journal of Ethnographic Theory. 5(1) 454 – 458, part of Anthropology and STS: Generative interfaces, multiple locations. West, Paige. 2014. Such A Site for Play, This Edge: Surfing, Tourism and Modernist Fantasy in Papua New Guinea. In Global Sport in the Pacific, edited by Fa’anofo Lisaclaire Uperesa and Tom Mountjoy. Special issue of The Contemporary Pacific 26 (2). (with many multiple authors). 2014. Changing the Intellectual Climate. Nature Climate Change. 4:763 – 768. Valencia, Vivian, Luis Garcia-Barrios, Paige West, Elenaor J. Sterling, and Shahid Naeem. 2014. The role of coffee agroforestry in the conservation of forest tree diversity and community composition in La Sepultura Biosphere Reserve in Chiapas, Mexico. Agriculture, Ecosystems and Envioronment. Volume 189, May 1, pp 154-163. Ogden, Laura, Nik Heynen, Ulrich Oslender, Paige West, Karim-Aly Kassam, and Paul Robbins. 2013. Place, Equity and Earth Stewardship in the Anthropocene. Frontiers in Ecology and the Environment. 11(7): 341-347. (with many multiple authors). 2012. Averting biodiversity collapse in tropical forest protected areas. Nature, 489, 290-294. West, Paige. 2012 Globalization, Place, and Theory in Anthropology. Anthropology Now. West, Paige. 2010. Response to Reader’s reviews (critical essay response to reviews of Conservation is Our Government Now). Pacific Studies 33 (1): 102 -120. West, Paige. 2010. Making The Market: Specialty Coffee, Generational Pitches, and Papua New Guinea. Antipode. 42 (3) 690 – 718. Peterson, Richard, Paige West, Diane Russell and Peter Brosius. 2010. Seeing (and Doing) Conservation Through a Cultural Lenses, Environmental Management 45:5–18. West, Paige and James G. Carrier. 2010. Introduction: Surroundings, Selves, and Others: The Political Economy of Environment and Identity, Landscape Research. 34 (2) 157 – 170. West, Paige. 2008. Scientific Tourism: Imagining, Experiencing, and Portraying Environment and Society in Papua New Guinea, Current Anthropology. (with comments and reply) 49 (4): 597-626. West, Paige, and Daniel Brockington. 2006. Some Unexpected Consequences of Protected Areas: An Anthropological Perspective. Conservation Biology 20 (3):609-616. West, Paige, and Daniel Brockington. 2006. Una Perspectiva Antropológica de Algunas Consecuencias Inesperadas de Áreas Protegidas. NeoCons 6 (3):609-616. West, Paige, Daniel Brockington, and James Igoe. 2006. Parks and Peoples: The Social Effects of Protected Areas. Annual Review of Anthropology 20 (3):609-616. West, Paige. 2006. Environmental Conservation and Mining: Between Experience and Expectation in the Eastern Highlands of Papua New Guinea. The Contemporary Pacific 18 (2):295-313. West, Paige. 2005. Translation, Value, and Space: Theorizing an Ethnographic and Engaged Environmental Anthropology. American Anthropologist 107 (4):632-642. West, Paige. 2005. Holding the Story Forever: The Aesthetics of Ethnographic Labor. Anthropological Forum 15 (3):267-275. West, Paige, and James G. Carrier. 2004. Getting Away From It All? Ecotourism and Authenticity (with commentary and reply). Current Anthropology 45 (4):483-498. West, Paige. 2003. Knowing the Fight: The Politics of Conservation in Papua New Guinea. Anthropology in Action: Journal for Applied Anthropology in Policy and Practice 10 (2):38-45. West, Paige. 2001. Environmental Non-Governmental Organizations and the Nature of Ethnographic Inquiry. Social Analysis 45 (2):55-77. West, Paige and Enock Kale. 2015. The Fate of Crater Mountain: Forest Conservation in the Eastern Highlands of Papua New Guinea. IN Tropical Forests of Oceania. J. Bell, P. West and C. Filer, eds. Australian National University Press. West, Paige. 2015. “Translation, Value, and Space: Theorizing an Ethnographic and Engaged Environmental Anthropology” (reprit of West, Paige. 2006. ‘Translation, Value, and Space: Theorizing an Ethnographic and Engaged Environmental Anthropology’. American Anthropologist, 107(4): 632–642.) in Environmental Anthropology: Critical Concepts, Routledge. 2015. Ogden, Laura, Nik Heynen, Ulrich Oslender, Paige West, Karim-Aly Kassam, and Paul Robbins. 2015. Place, Equity and Earth Stewardship in the Anthropocene. 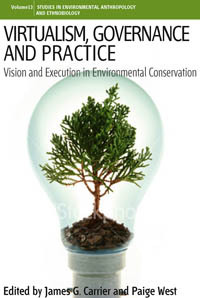 In Earth Stewardship: Linking Ecology & Ethics in Theory and Practice (edited by Ricardo Rozzi, Steward Pickett, J. Baird Callicott, Terry Chapin, Mary Power, & Juan Armesto), published by Springer. Aini, John and Paige West. 2014. Learing through Doing: The story of Ailan Awareness’s partnerships with coastal communities. 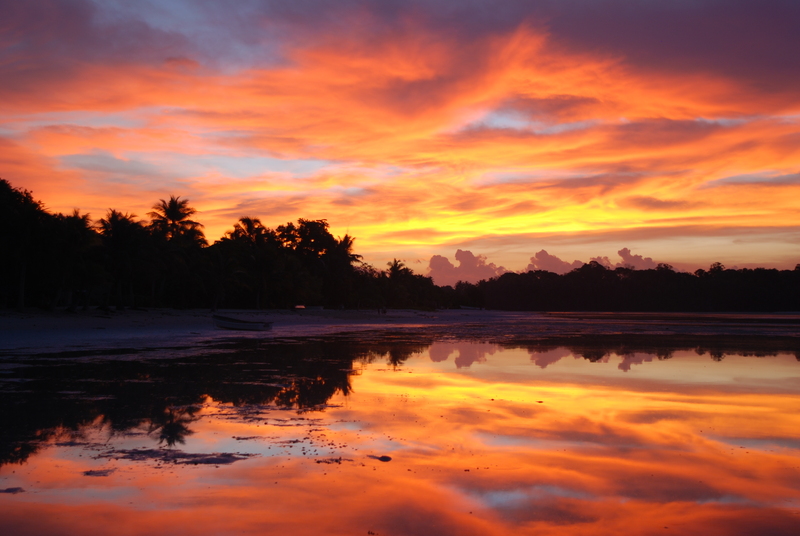 Resilance Sourcebook: Case Studies of Social-Ecological Resilience in Island Systems. New York: American Museum of Natural History. West, Paige. 2011. Making The Market: Specialty Coffee, Generational Pitches, and Papua New Guinea. Brockington D. and R. Duffy. Conservation and Capitalism (Wiley and Sons Ltd). West, Paige and James G. Carrier. 2010. “Introduction: Virtualism, Governance and Practice, a new approach.” In Virtualism, Governance and Practice. Paige West and James G. Carrier, eds.. London: Berghan Books. West, Paige, Daniel Brockington, and James Igoe. 2008. Parks and Peoples: The Social Effects of Protected Areas. In Biodiversity and Conservation. Richard Ladle, ed.. London: Routledge. West, Paige. 2008. Conservation Actions and Events in Papua New Guinea. In Against the Grain: The Vayda Tradition in Human Ecology and Ecological Anthropology. Bradley Walters, Bonnie J. McCay, Paige West, and Susan Lees, eds.. Lantham, MD: Lexington Books. West, Paige. 2004. Environmental NGOs and the Nature of Ethnographic Inquiry. In Anthropology and Consultancy. P. J. Stewart and A. Strathern, eds.. New York and Oxford: Berghan Books. Ellis, David M., and Paige West. 2004. Local History as ‘Indigenous Knowledge’: Aeroplanes, Conservation and Development in Haia and Maimafu, Papua New Guinea. In Investigating Local Knowledge: New Directions, New Approaches. Bicker, A., P. Sillitoe, and J. Pottier, eds.. London: Ashgate Publishing.